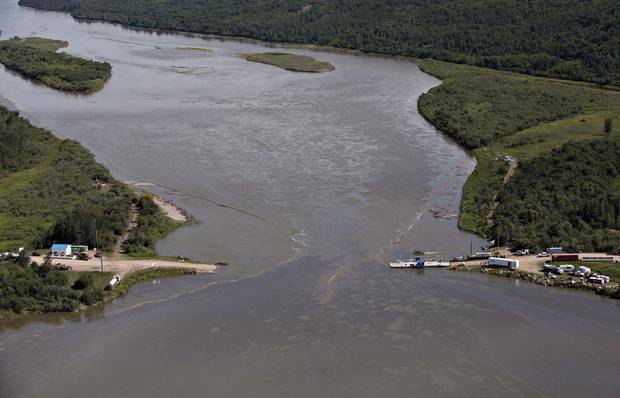 Crews work to clean up an oil spill on the North Saskatchewan river near Maidstone, Sask. on Friday, July 22, 2016. Jim Toye spent weeks asking Husky Energy Inc. for a 10-litre sample of oil and diluent comparable to the mix the company spilled into the North Saskatchewan River in July. 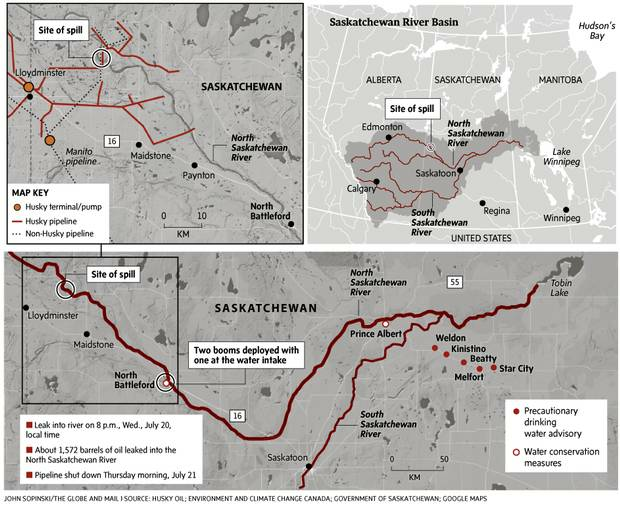 The city manager for Prince Albert, Sask., wanted more precise information on the toxins polluting the community's sole source of water so he and his team of specialists could figure out how to filter out contaminants from the spill, making the water safe for roughly 60,000 people. They needed the sample. They got it last week, a month later. And the folks who wanted it had to fetch it themselves from Maidstone, a three-hour drive away and the town closest to the spill. "How do we know what's coming down the river unless we got a sample of it?" Mr. Toye said in an interview this week. "We went to Maidstone and got it ourselves. … Every day now counts with winter coming." For more than a month, Prince Albert has been getting by on three emergency sources of water, but October's freeze-up will put an end to those makeshift alternatives. The city is not alone in its struggle to obtain accurate and timely information from Husky and the provincial government. Red Pheasant Cree Nation near North Battleford has done its own water testing. James Smith Cree Nation near Melfort installed its own booms on the river and is testing the water itself. Scientists want Husky and the government to post all the raw data from their water tests so they can be scrutinized by outsiders. 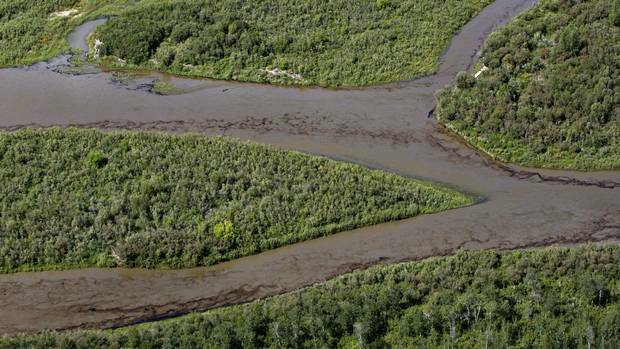 Husky estimates it spilled between 200,000 and 250,000 litres of oil and diluent into the river. Crews work to clean up an oil spill on the North Saskatchewan river near Maidstone, Sask on Friday July 22, 2016. At a time when questions about pipeline safety have hung up approvals for three major projects across Canada, the Husky spill is proving a major test for Saskatchewan's regulatory system. The province does not have an independent regulator like its counterpart in Alberta. Instead, Saskatchewan's Ministry of the Economy is "conducting a full and thorough review of the incident to determine its cause and any required changes to operation and/or response," according to Karen Hill, a spokeswoman for the government's executive council. The economy department's mandate includes generating wealth and expanding the economy – and the province's resources are key to those two pillars. Other departments and agencies, including the Ministry of the Environment and Water Security Agency, are involved. Alberta moved away from this type of patchwork system in 2013, consolidating responsibility for enforcing resource regulations into a single arms-length body called the Alberta Energy Regulator. It, too, has its critics. Husky, a global energy firm controlled by Hong Kong billionaire Li Ka-shing, has accepted full blame for the incident. It has already distributed millions of dollars to help cities and businesses cover expenses and lost revenue as a result of the leak. Officials in North Battleford and Melfort – two other cities affected by the contaminated water – have praised the company, and even Prince Albert's Mr. Toye is pleased with Husky's financial response. But critics are concerned about the amount of independent analysis of tests performed by Husky and the government. 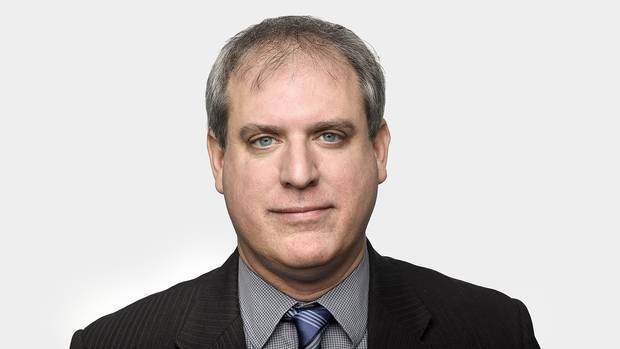 Tim Jardine, a professor at the University of Saskatchewan's School of Environment and Sustainability, wants all the raw data from the water test results published, rather than having to rely on Husky's broad overview. That would allow specialists such as non-governmental organizations or university scientists to analyze the tests independently. "It increases the transparency of the process … even if not everyone [in the public] can totally understand perfectly what the numbers mean." Officials from Husky and the Saskatchewan government are running a "unified command" centre to co-ordinate cleanup and testing. First Nations have a seat in the hub. Prince Albert, the largest centre affected by the spill, does not. Husky's pipeline-monitoring system detected "pressure anomalies" in the line July 20. The company, in an update July 26, noted this is normal when restarting parts of a pipeline network. The firm dispatched crews along the network. They did not find any leaks. The company planned to survey the pipeline from the air at dawn. During the night, Husky decided to shut down the system at 6 a.m. By morning, Husky received reports of a sheen on the river. The Saskatchewan government first announced the leak July 21. Husky did not immediately give Prince Albert the requested oil sample because the firm first wanted to know how the city would use it, company spokesman Mel Duvall said. "Our water experts were trying to better understand how the crude-oil sample would be used for analysis. The crude oil taken from the pipeline would not be an accurate representation of any oil that might make it to Prince Albert, given that it would need to travel downstream for 390 kilometres and undergo weeks or months of weathering." But Saskatchewan's Water Security Agency has results for 120 surface water-quality samples. It found one that did not meet "the current drinking water quality guidelines," at North Battleford, according to a statement it released Thursday. Sixteen samples exceeded guidelines for the protection of aquatic life. The agency also detected hydrocarbons in some sediment samples. Six exceeded Canada's sentiment quality standards. Those regulations protect organisms living in or on the bottom of sediments "and thereby the aquatic food chain, but are not of direct concern for people," the WSA said Thursday. The agency posted raw data on its website. Husky also has specialists testing the water along 385 kilometres of shoreline affected by the spill. The company, which has drawn 4,000 samples from about 60 locations, has released summaries of its findings. Of 1,400 samples, for example, Husky found 37 instances where toluene exceeded quality guidelines for freshwater aquatic life. Eight samples surpassed pyrene standards, the company said in its Aug. 8 update. The province has counted 144 confirmed wildlife deaths, including 51 aquatic species, as a result of the spill. Roughly 73 per cent of the estimated oil released has now been recovered, Mr. Duvall and the government note. Oil is seen on the North Saskatchewan river near Maidstone on July 22, 2016. Officials say more assessments are needed before the river can be used as a drinking water source. Chief Wally Burns leads James Smith Cree Nation near Melfort, and about 11 kilometres of the North Saskatchewan runs through the band's land. The band has spent thousands of dollars installing booms and hiring a water specialist from Calgary. The community is reluctant to rely solely on test results Husky and the government provide, Chief Burns said Friday. "We did this on our own," he said, although the band expects to be reimbursed. "The people who did this have to pay." Prince Albert is still waiting for Husky to deliver its water-quality report – data the city expected to land about two weeks ago. Municipal officials hope it, too, will contain information that will help Prince Albert adjust its water-treatment plans and identify technology that could deal with the dirty water. (Husky said it is, indeed, sharing testing information). Prince Albert is relying on a hose stretching about 30 kilometres to the South Saskatchewan River, a program costing about $2-million a month. Husky, Mr. Toye said, has been quick with cash to help cover expenses. But if Prince Albert is unable to draw from the North Saskatchewan River by October, its problem will exacerbate. Water in the hose will freeze. It may have to heat the water or the line in order to keep it flowing – expensive and unproven proposals. Husky and the government are still trying to determine what caused the leak. Saskatchewan officials do not yet know whether Husky will face regulatory consequences. Husky has even deployed dogs – Pepper and Patton – to sniff out hydrocarbons clinging to the shoreline. The busted pipeline is inspected monthly and more thoroughly every two years, Mr. Duvall said. Its last major inspection took place in 2015, he said. Saskatchewan officials, in an update with reporters Thursday, said they expect water from the North Saskatchewan will be clean enough to use by freeze-up. North Battleford, meanwhile, smoothly switched over to existing wells for water and connected a hose to the nearby Battle River. North Battleford has since added wells. Melfort's water system services about 10,000 people, and the provincial government treats it. The city reverted to a water source it used years ago when its normal source risked contamination, Melfort's director of works and utilities Gerald Gilmore said. It doesn't taste as good or smell the same, but it works and winter will not interfere. The government and Husky, Mr. Gilmore said, have been exceptional. "It couldn't be any better," he said.